INVITING SPIRITUAL REFLECTIONS! Sense the sacrifices Jesus made for each of us. 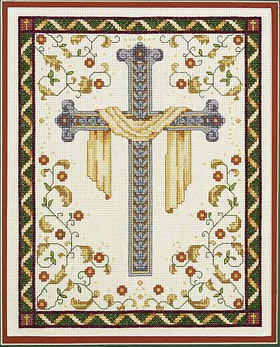 A DESIGNS For The Needle® Counted Cross Stitch design by ©Sandra Garbrandt. A touching reminder of God's love - stitch for a friend. Each kit contains 14-count off-white cotton Aida fabric, 6-strand cotton carded floss, needle, graph and instructions in English, French, German and Spanish.Size: 8" x 10" (20,3 x 25,4 cm).